I’m not the sharpest knife in the drawer, especially when it comes to knowing things that have actual, real-world applications. I can go on and on about mostly useless trivia (god bless Master of Arts degrees), but I always seem to be learning basic things that other people have knownsince the 1980s… at least. 1. 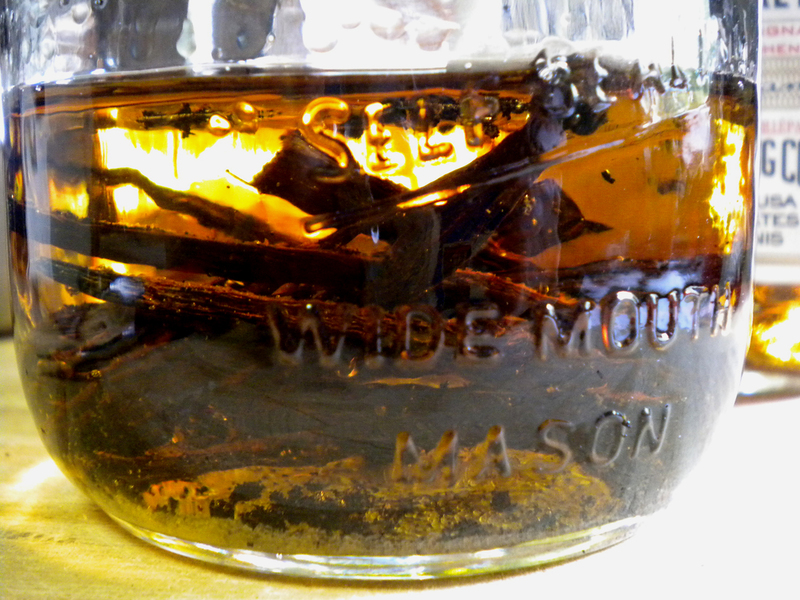 It is possible to make vanilla extract at home. This should not have been news to me, having descended from a woman who insisted on making her own ketchup, curry pastes, bread, and soup stocks. My mom endeavoured to make as much food from scratch as possible when we were growing up, but somehow, the thought that vanilla extract could also be made at home escaped me until very recently. I just assumed it was untouchable. I use a ton of vanilla in my kitchen. It goes in my oatmeal every morning, flavours my weekly batch of almond milk, and features prominently in any cake or baked good recipe I test out (for scientific purposes only. Obviously.) Each bottle of vanilla extract runs around a hefty $8-$12 from the store, so discovering that I could make a schwack of vanilla extract– easily, by myself, at home, for a fraction of the cost of the store-bought variety– felt like the Secret of Life had been whispered sweetly into my ear. Homemade vanilla extract! Who knew? The recipe I found online for homemade vanilla extract called for some bourbon. 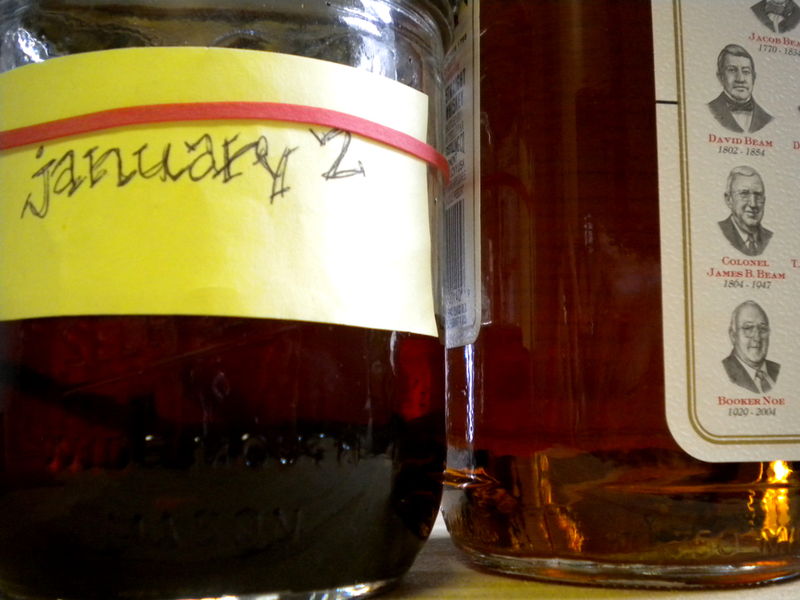 I ventured out to the local liquor store, post-haste, and scanned the aisles for the telltale “Bourbon” sign. None could be found! I saw signs for Wine, B.C. Wine, Beer, Vodka, Liqueurs, and all sorts of other spirits, but the Bourbon sign was conspicuously absent from the lot. Anyway: bourbon. I lingered in certain sections of the liquor store, trying to locate a godforsaken bottle of bourbon. I knew it wasn’t vodka. I knew it wasn’t wine. Finally, I stumbled into the whiskey section and noted with confusion that there were bottles of scotch, rye, and Irish whiskeys there. Another awkward minute passed, and thankfully, I happened to read the blessed words “bourbon” on a bottle of Jim Beam. Yes! Bourbon!! I snatched it up (in retrospect, a little too swiftly) and then was promptly asked to show my ID to the clerk at the till. Next time I’ll know: bourbon IS whiskey. I might even escape the dreaded ID check– Thank you, Dr. Obvious! 3. Vanilla is a ‘bean’ in the ‘green’, ‘yellow’, or ‘string’ sense of the term, not in the ‘mung’ or ‘kidney’ sense. I felt so mature bringing home a bottle of Jim Beam bourbon. I win liquor store shopping! I laid it out on the kitchen counter when I got home, along with a clean jar and several vanilla pods. 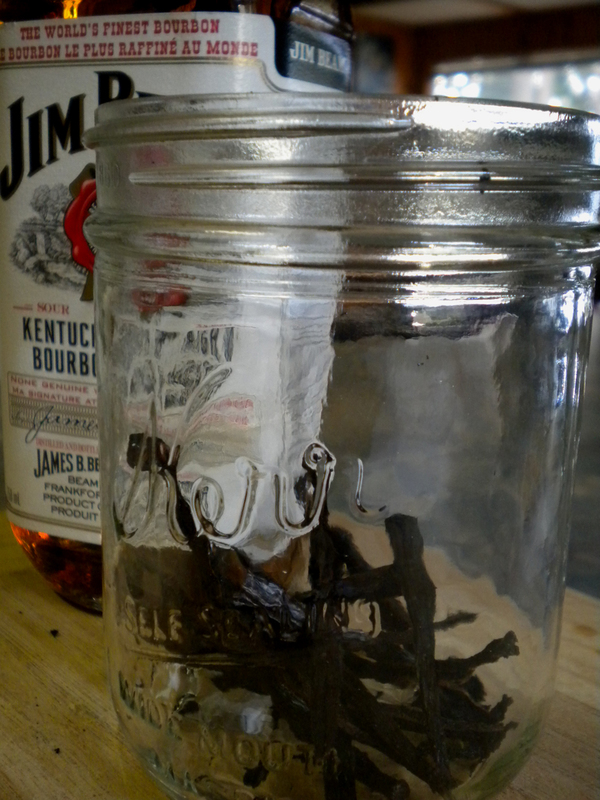 The recipe calls for a ratio of 4 vanilla beans to 1 cup of bourbon, so I gleefully laid out three long vanilla pods and sliced them open lengthwise, fully expecting tiny “beans”– many more than four of them– to spill forth. 4. “Bourbon” Vanilla Extract can actually be made with vodka. Be honest: you see a bottle of “Madagascar Bourbon Vanilla Extract” at the store and automatically assume it was made with bourbon whiskey. I did, too! 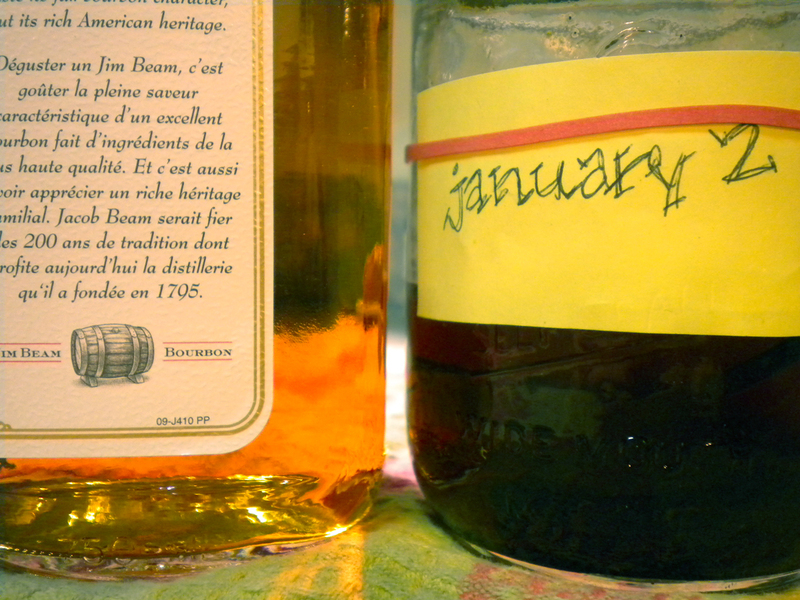 Alas, it was only after I purchased a gigantic bottle of Jim Beam Bourbon that I read more about vanilla extract online. 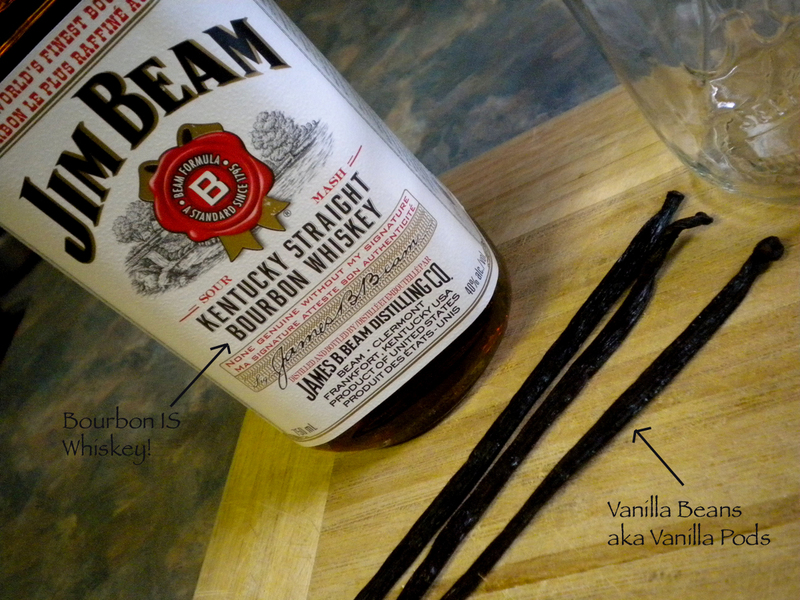 Turns out that the “bourbon” part actually refers to the type of vanilla bean that is used, not the alcohol itself. 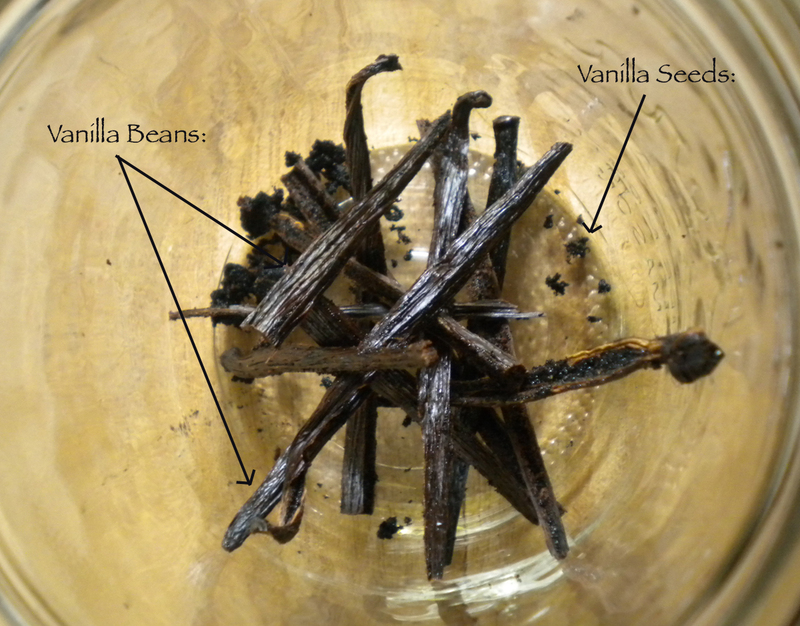 There are “Tahitian” and “Bourbon” types of vanilla beans, and just about any ol’ alcohol can be used as a base to make your own extract. Just don’t use beer. I think that would be nasty. Two weeks of sitting… only six more weeks to wait! 2. Slice beans lengthwise and place into clean jar with alcohol. 4. Gently shake your vanilla brew every couple of days. 5. Use as you would store-bought vanilla extract after 8 weeks of waiting. Patience is a virtue, my friends. 6. 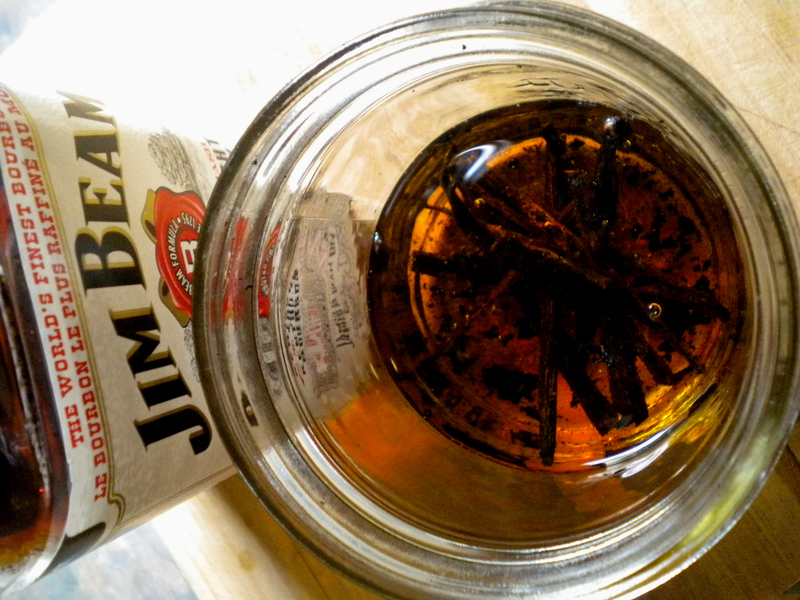 Marvel at all the money you saved, simply by putting vanilla beans in a jar with regular ol’ alcohol. I started off with a modest 3/4 cup of alcohol and 3 vanilla beans, partly because I wanted to test this recipe out before making a gallon of it, but mostly because I had only purchased 3 vanilla pods in advance from Planet Organic. I assumed that 3 pods would contain 30+ seeds/beans inside, but I was so wrong. I’ve since ordered a giant sack of vanilla beans/pods from Mountain Rose Herbs, and I will be adding them to my mostly-full Jim Beam bottle in the next few days.